Receive 15% off class supply list with paid class fee. Sewing Club receive15% off all regularly priced fabric, notions, patterns or books when you attend club & have purchased your machine from AQF. Embroidery club receive 15% discount on supply list. Homework: Many of the classes will have students do work at home to prepare for the class. We ask this in order to keep the cost of a class to a minimum, to prevent additional class fees. Once the class begins the instructor needs to focus their entire attention on teaching the class topic. If you are having difficulty preparing ahead for a class, please email the instructor for advice/ assistance. Lots of pockets, easy top zipper closure and purse feet - Oh My! This is a great medium sized bag that is amazing for everyday use. There are pockets on the inside as well as one on each outside panel. You can show off some beautiful fabric on these large pockets. Come join the fun! With one simple block, 3 awesome fabrics, and 5 classes you can achieve this fun quilt. It looks complex but in this series we break down the quilt making process into small bite size steps that any beginner can complete. If you've started a collage and haven't had the time or inspiration to complete it, join your fellow "collagers". Bring your incomplete collage, fabric to share and get prepared to get closer to finished or even finish. Each month we'll utilize our embroidery machine-hands-on-and create some fun and unique projects. Receive 15% off supplies listed for our monthly embroidery club project. Exclusive Kimberbell Machine Embroidery Class - May "Machine Embroider by Number Summer Popsicle"
Did you ever count the days of summer in popsicle sticks? With three layers of icy sweetness, the pieced popsicle block features crosshatch quilting on the large and medium sizes with optional ribbon loops for hanging! Conquer the Curved seam with this fun pattern. The 12" glam clam is large enough to learn to seam a curve, but not as tedious as a small drunkards path curve. Have your favorite shirts and wonderful memories all captured under a cozy hug of a quilt! Learn how to turn those shirts into a quilt top to enjoy! Join us each month as we journey through all the wonderful features of the Premier + Embroidery Software! Calling all embroidery people. This is the technique for you to showcase your embroidered blocks without having to use paper foundation piecing. However, Stacked Squares is for everybody. You can create depth in your quilt tops as well as secondary patterns. This also allows for fussy cutting and featuring special fabric. In this session, the kids will create a pillow case and a mystery stuffed animal. Volcanoes don't belong in the center of an eight-pointed star and they won't happen to you when you use the Rapid Fire Lemoyne Star Tool. And, by the way, there will be no Y-seams! Be thoroughly stunned when you learn how to make a Lemoyne Star using a strip method. You will be able to make blocks as small as 3" all the way up to 12" with the same level of accuracy. The Square Squared unit can be found within blocks as well as sashing. Since this unit is often used to connect other units, the points are extremely valuable for the design to work without interruption. You will save those points with the Square Squared tool. A secondary benefit to using Deb Tucker's method of creating Square Squared units is that you will not waste fabric. It's a win-win situation. Are you hooked on the Rapid Fire Lemoyne Star tool? You can make fancy Lemoyne Stars by learning how to create three more variations: Strip Pieced Lemoyne, Liberty Lemoyne, and Banded Lemoyne. For those participating in the Block of the Month this year and have attended the Rapid Lemoyne Basic construction class, this class is also for you. The Block of the Month will contain a strip pieced Lemoyne and a Banded Lemoyne block. If you are seeing stars in your future then you have just found your new best friend, the V Block. 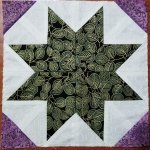 Making stars is not the only thing the V Block can do to improve your piecing techniques. Once you learn how to use the V Block, you will not go back to those plastic templates or guessing where the dog ears go. Push the V Block a bit further by learning how to create Sidekicks and High/low units. You will amaze your quilting friends by thinking that you made a difficult unit, when in fact the use of the V Block made your life so easy.